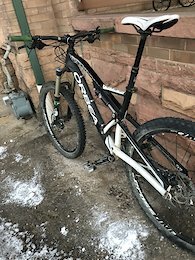 Orbea Rallon- an awesome, fun, responsive mountain monster. If your looking for a bike that can handle pretty much anything you throw at it... you’ve found it! Mainly stock except tires, bars, and will come without pedals. Will come with brand new grips. Usual cosmetic damage... ridding pads, shuttling, etc. Only minor mechanical issue is that the seat post trigger piston is bent... still works... just bent and kind of a pain. Easily fixable - can replace for additional cost. All work on bike has been done by team mechanic or at full cycle in Boulder. Please feel free to reach me with any questions. Buyer pays shipping fees.